If you are looking for a quick 15 minute dinner idea then you’re in for a treat. 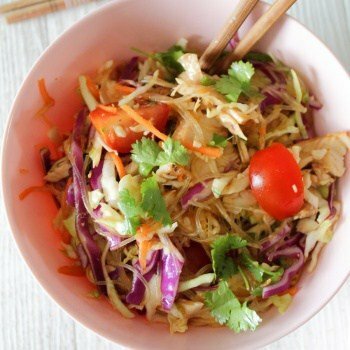 I discovered this 15 minute Thai Chicken and noodle salad at a friends dinner party about two years ago and have been making it ever since. It uses every trick in the meal planning handbook so you can even whip it together even after a longest day at work. 1. Rotisserie Chicken. It doesn’t take too long to fry up sliced chicken breast, but to save a few minutes, feel free to use shredded rotisserie chicken or precooked shredded chicken. MEAL PREP TIP: I make it a habit to roast and shred a whole chicken every weekend. I can then use the chicken in wraps, sandwiches or in this Thai noodle recipe. To avoid any food waste, freeze half the shredded chicken (I’m obsessed with these containers) and pop the other half in the fridge. 2. Bagged and Prepped vegetables. I recently splurged on a spiraliser so I’m now shredding my veggies in lighting speed, but pre-spiraliser days I would include a bag of shredded slaw in my grocery shop. 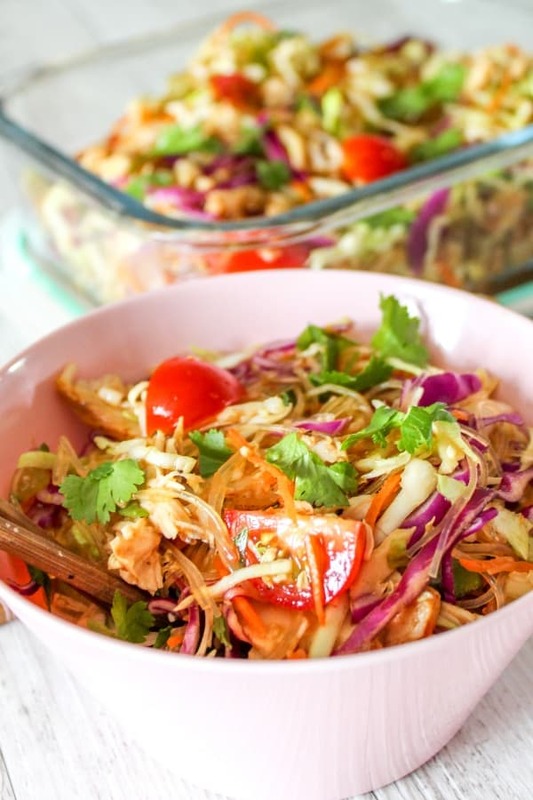 This recipe calls for 2-3 cups of shredded veggies so a medium sized bag should do it. You can pretty much use any shredded veggie or salad ingredient so raid your fridge. Fresh coriander always finishes it off nicely. 3. Keep Bottled ginger and garlic. OK, so fresh garlic and ginger is amazing, but if you are under a little dinner time pressure, you can save yourself a few minutes by keeping pre-crushed ginger and garlic in the fridge. I cannot even tell you how many times this little tip has come to the rescue after I’ve opened the pantry to find I’m missing the fresh stuff. If you have a picky eater or two in the family, try serving this meal up as a DIY dinner. Keep chicken, noodles, veggies in separate bowls and let them ‘build their own bowl’. The rule in my home is they have to have minimum of two salad or veggies. Pour boiling water over the noodles and make sure the noodles are totally submerged. Cover with a lid and allow to sit for 4-5 minutes until tender. Stir to prevent sticking together. Drain water from the noodles using a colander and rinse under cold water. Prep noodles (see instructions above). I use about 3 cups of cooked noodles. Mix all ingredients together. Pour over salad.